New Taipei City is a special municipality, was originally a county known as Taipei County before 2010, which surrounds Taipei City. 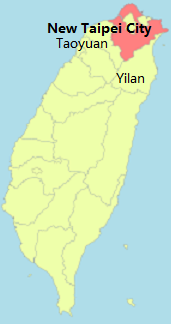 New Taipei City is bordered by Keelung to the northeast, Yilan County to the southeast, Taoyuan to the southwest and the north, northwest and east are facing the Pacific Ocean. Total area about 2,052.60 sq. km. Has a population of about 3,966,818 people in Dec. 2014, ranked 1st of 22 counties and have a density of 1,900 people per sq. km. 1) Luzhou. 2) Sanchong. 3) Shulin. 4) Sanxia. 5) Yingge. 6) Tamsui. 7) Bali. 8) Jinshan. 9) Sanzhi. 10) Shimen. 11) Wanli. 12) Xindian. 13) Pinglin. 14) Shenkeng. 15) Shiding. 16) Wulai. 17) Xizhi. 18) Ruifang. 19) Gongliao. 20) Pingxi. 21) Shuangxi. 22) Xinzhuang. 23) Lingkou. 24) Taishan. 25) Wugu. 26) Banqiao. 27) Yonghe 28) Zhonghe. 29) Tucheng. Jiufen was a prosperous gold mining town, and went into sharp decline when mining was discontinued and became a ghost town to this mountain city. Only after the success of the film "City of Sadness" led to the transformaion of Jiufen into a must see sight to many visitors. Jiufen not only refer to the "old street", there are three little towns whereby you should visit them too, Shuinandon - A cave looks like the Shuiliangdong in the "Journey to the West, monkey god of Chinese folk believe, Jinguashi - the golden water fall and Jiufen - the hilly old streets, tea houses, hillside architectures, stunning views of the Pacific Ocean, are what you don't want to miss. Shenkeng the Tofu Capital, here you will be able to find the famous "authentic stinky tofu' and there are many difference type of toufu if you never like to try the "stinky tofu", the local three treasure are: Braise Toufu (Hongshao Tofu), Tofu Soup and the Sweet & Sour fish, the two tofu mention here there are not stinky, but since you are here you must try the stinky tofu, is like durain - the smell is not to your liking but the taste is marvelous. It will be nice to visit this little town even you are not the "tofu" lover, see why it has earned the name of "tofu capital". Like we said other than tofu and the local three treasure, there are other foods and authentic drinks, you may also be able to find arts, antique, souvenir, gifts and many other long lost accessories shops around. Check out the old building is another way to tour around this little town, many of the shops here are doing business in their own ancestor home which are about 100 years old. This area consist of Shifen Old Street, Jingan Suspension Bridege, Shifen Train Station and Shifen Waterfall, there are all within the PingXi Township. 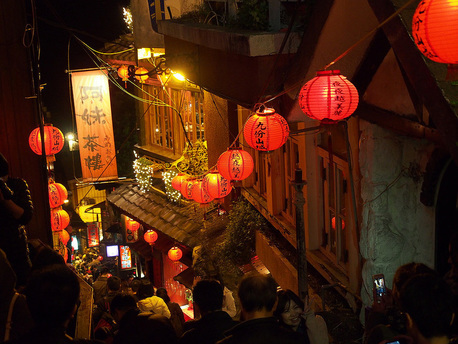 When you mention about Pingxi, many will relate it to Sky Lantern and Shifen Old Street, yes, Shifen Old Street is where the sky lantern started and most visitors come here for lighting up the sky lanterns to pray for good luck, good health and good fortune. This old street is special in a way that the old train passes through the street and railway is right in-front of your door step, and along both side of the railway there are souvenir shops, grocery stores and restaurants. Toward the end of the street is the Shifen Railway Station, and across the station there is a Jingan Suspension bridge which connects Shifen and Nanshan villages. Jingan Suspension bridge was originally used to transport coal, but now became a pedestrain bridge, walking along the bridge you will see the clean and clear Keelung river water flowing below you, nice feeling. 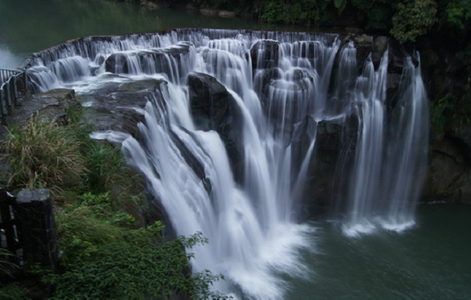 After this old street and suspension bridge, you may process to the near be waterfall, the "Little Niagara" of Taiwan - Shifen waterfall, the waterfall is a 20 meters height and 40 meters in width, making this curtain like water fall the broadest and renowned cascade style water in Taiwan. Tamsui District situated in the north of New Taipei City, was the center of shipping and commerce in northern Taiwan in the 19th century. In this district you find: Tamsui Old Street, Tamsui Church, Fort San Domingo (Hong Mao Chen) and Tamsui Fisherman's Wharf are the four places which we will recommend. Almost all visitors to Tamsui will never missed this street, this old street are filled with local food and snacks, craft,, shops, restaurants and many street artists to help paint your picture and a never miss sunset view, also to scroll along the riverside is another way for relaxation. Not far away from the old street, you will be able to see the first Canadian Presbyterian Church known as Tamsui Church now, this chapel was built for the commemoration of the 60th anniversary of Dr. Mackay's coming to Taiwan and was rebuilt in 1932. Dr. George Leslie Mackay has contributions to Taiwan in the areas of religion, Western medicine, education and anthropological research. Once an important fishing port in the early days of Northern Taiwan, now has turned into a place for leisure, fishing, arts and craft center, and often hold concerts and performances too. Most tourist are here for the beautiful sunsets, fresh seafood, coffee, the lighted up night view of lover's bridge and floating piers for the perfect seaside feel.edit. 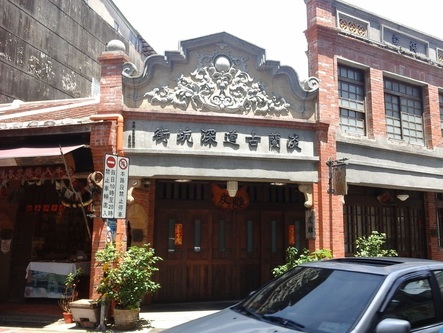 Before reaching Tamsui Old Street from Taipei pay attention to your right side of the road you should be able to notice a Red building, the Fort San Domingo, nick name Hong Mao Chen, now designated as "Class One" historical monument. Fort San Domingo is a fort built in 1628 by the Spanish, thereafter has been owned by different nationals from the Spanish, the Dutch , The Qing Dynasty, the Japanese, the British, the Australian, the Americans and Taiwanese took it back in year 1980. It is one of the rare historical sites that has a great mix of foreign culture influences, worth to take a look at it. A small and lovely aboriginal village and its natural hot spring is in New Taipei City. 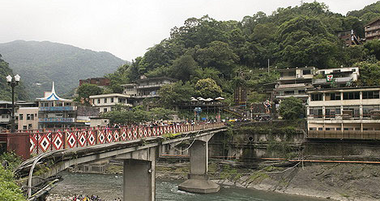 Other than the natural hot spring and natural attractions, the village is home to the Wulai Atalyal tribe, is a great place to learn more about the indigenous culture of Taiwan. The Wulai Atalyal Museum, shops specialize in Atalyal clothing, arts, foods and crafts and cultural performances scattered throughout the village. You may also try out the Wulai Scenic Train which is a converted Japanese mining cat system and now rebuilt for tourists. The power and arts of the nature, Yehliu Geopark is where it provides you a chance to explore and view the most unusual landscapes created by nature and is one of the world wonder. 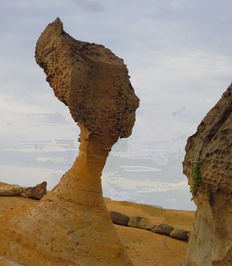 In this dramatic geological park you will see more than hundreds of rocks in the shape of mushrooms, candle, tofu, fairy's shoe, beehive, elephant and many others, of course the Queen's head is the land mark shape of Yehliu. Come and experience this educational and scenic view that you never regrets. At the northernmost tip of Taiwan, standing at the end of the trail in Fugui Cape Park is where you find Fugui Cape lighthouse, this lighthouse was built in 1896 with the unique octagonal building painted with black and white on the exterior is to make it more visible in fog for passing by ships. 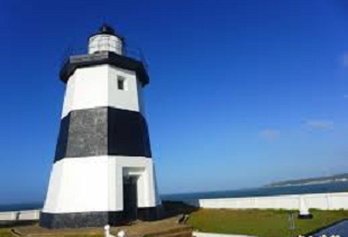 Next to the light house the Laomei Reff, a geographical oddity, over hundreds or possibly thousands of years channels have been cut into a volcanic rock located within the daily tidal range. 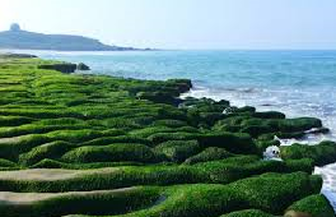 The wonderful things about these reef is that it growth green algal and covers the reef at the peak in April and May which offer unique sceneries - green-green grass on the sea. Be sure to check the tide table before you visit to this place, otherwise you will see nothing when it is high tide, because the sea water will cover the reef. Please note that when summer comes the hot weather kill off the green algal and you only reef during low tide, but still offer scenic view.